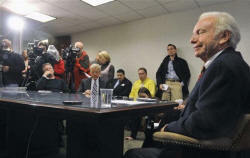 [November 26, 2008] HARTFORD, Conn. (AP) -- Connecticut Sen. Joe Lieberman took another step Tuesday toward mending his relationship with Democrats, saying that Barack Obama's actions since winning the presidency have been "just about perfect." Democrats threatened to strip him of his chairmanship of the Homeland Security and Governmental Affairs committee but instead removed him as head of a smaller environmental subcommittee. "It appears to me that the war in Iraq is coming to a successful -- I don't want to say conclusion yet, but it's moving in a way that it will not be a divisive issue either in the Democratic Party or between Democrats and Republicans in the time ahead," Lieberman said. "And therefore, I think we'll return to more normal times, which I welcome."